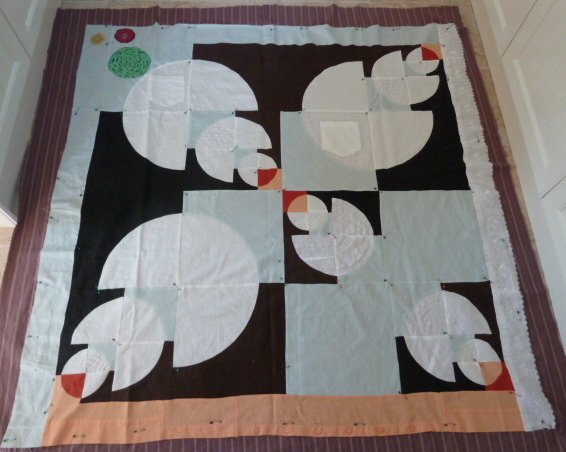 First of all let me say I’m planning to take a small blogging break while I reorder my blog and my quilting priorities. If you want to be kept informed then please sign up for email notifications or the RSS feed and you’ll get the next blog post right in your Inbox or Blog Reader. What is it? Well I think if you walk into your sewing room you’ll be able to identify it, especially if you’ve been quilting for 10 or more years. 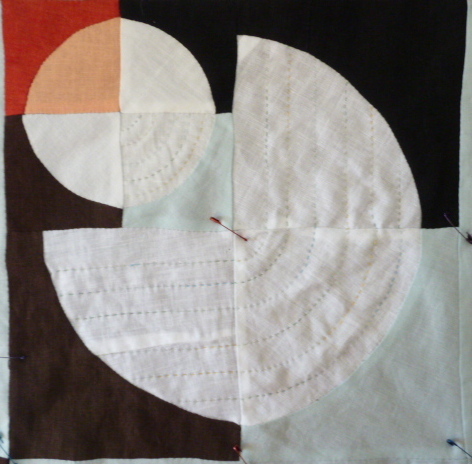 We quilters are like magpies. We see something bright and pretty and we want it. That’s not a problem in itself but the next step is – we buy it, we stash it and we don’t use it. I’ve only been quilting for a few years so my stash is tame by comparison with many. But lately I’ve been reading about several people who’ve had to go through a friend’s stash and deal with it (i.e. get rid of it) for her family when that person has passed away. Fabric, it would seem is a bit like food, we see it, we want it, we consume it and then we have store it – not on the hips, it’s true, but store it nevertheless. Exercise. 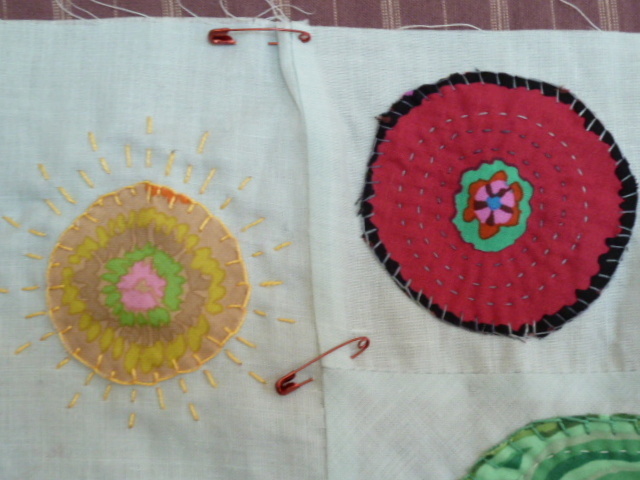 Just like exercise works off stored food, quilting exercise uses up stored fabric. I’m really committed to reducing this excess and using my stash – smallish as it is – before buying any more fabric. I started the year with the idea of a fabric fast and I fell off the wagon a couple of times with various excuses. Now, I’m serious. Making this Traveller’s Blanket from used linen clothing made me realise how little I needed to buy new fabric and how I don’t want to hoard any more. I’m planning some quilts to use up my stash and if you want to join me in the Fabric Slimming Quilt-along then please do. I’ll leave you with some photos of where I’m up to with the Traveller’s Blanket. God Willing I’ll be back in alittle while with details of my plan and how you can join in. Till then why don’t you arrange your stash to see exactly what you’ve got in there. I’ll bet you find fabric you’d completely forgotten about. This is exactly how I feel and so I haven’t bought any fabric this year, but I’ve still been able to find plenty of things to do with my stash, including swapping 2″ charm squares (100 at a time), I know this gives me some of other people’s stashes, but I’m finding out just how many different fabrics I have – and it is horrifying – but I’m also sewing bits of all my fabrics together as a scrap quilt and enjoying it as I can remember what I did with the original fabric and what was happening in my life. I’ve also joined in some other swaps and have been getting some beautiful blocks. Yes I swapped using the Travelling stash Farrah too. I couldn’t see any of the pictures…..8-( I hope you’re not gone too long. I miss you when I don’t hear from you in a while. Hi Linda. You should be able to see the pics now. I just had to move this post from the old host to the new one. Best of luck in your journey and please keep me posted. I’m betting that I’m one of those people you’re referring to about taking care of a friend’s sewing things. I kept a few things of Abby’s and have given 4 of our dear friends the opportunity to go thru her stuff. I’ve donated all of her children’s fabrics and brights to another friend who makes blankets for Children’s Hospice. Hard to believe but they’re greatly needed. I’m now going to contact various people I know to see if they want other stuff: stabilizers for embroidery machines, projects that they can teach, and a lady who teaches underprivledged kids how to sew. It will all get sent to good homes. It has also made me rethink my own stash, even though I did that last year. BUT, I took a class with Bonnie Hunter, the scrap queen of the quilting world and she was a great inspiration to get with the program! Stop buying and start sewing. I’ve cut up Abby’s scrap and am using it to make a blanket for her DH who is in a nursing home. Any left over, will be made into charity blankets. That’s my spin on the whole fabric obesity program! I love what you’ve done in these photos, Munaiba. I’m with you on the personal stash, although funnily enough, since I opened a shop I don’t seem to buy personal stuff any more. I still have more than I can sensibly use though, I think. Hope you’re feeling better, have missed you on line. 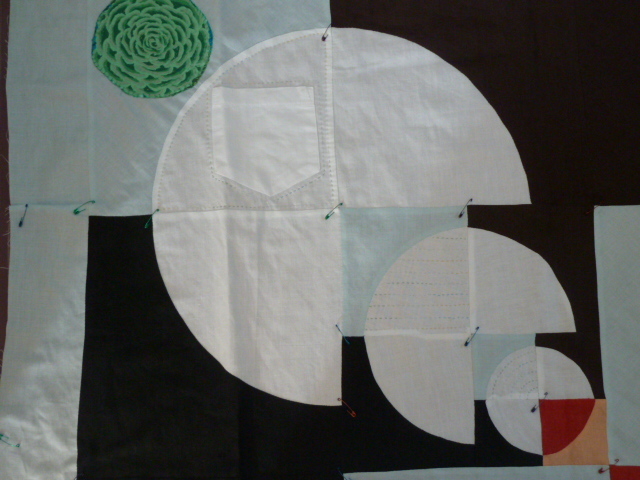 You are currently reading Fabric Obesity Crisis at Sewjournal.